Tajima builds top-of-the-line embroidery machines that are used world-wide. Upholding the Tajima tradition of exceptional workmanship, Accucopy's customer service matches the same high-quality that you would expect. 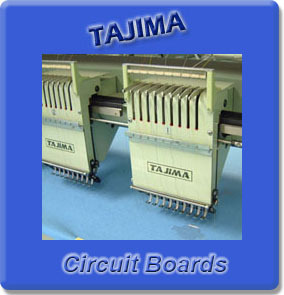 We specialize in the repair of printed circuit boards used on Tajima Embroidery Equipment. All circuit board repairs are warranted for a period of 3 months. We provide quick repair turn-around time, and for an additional fee, a rush service is available. Accucopy can provide new circuit boards, as well as, rebuild PCBs. Also, our highly trained staff can assist with electronic trouble-shooting of your embroidery equipment. Ask us about Copiers & Printers!